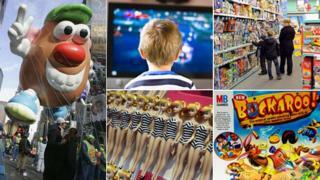 Is Mr Potato Head to blame for 'pester power' ads? It is 60 years since Mr Potato Head starred in the world's first television toy advert. Did the plastic spud unleash the era of pester power? With his bulbous nose, perpendicular ears and rictus grin, he makes for an unlikely-looking business trailblazer. And yet an industry worth millions owes its very existence to the synthetic, tuberous figurine that is Mr Potato Head. In commercials broadcast in the US in April 1952, he became, according to manufacturers Hasbro, the first toy advertised on television. It was an innovation that, by pitching directly to the product's juvenile target market, ushered in a post-war era in which children were specifically targeted as a consumer demographic. In doing so, however, Mr Potato Head would pave the way for complaints from generations of parents that children were being urged to pester them for countless commercially available treats - a process known in the UK as "pester power" and in the US as the "nag factor". Look back at early adverts from the 1950s for the spud-based plaything, however, and it's striking how old-fashioned and cumbersome they appear today, with a cartoon character carefully explaining to a pair of clean-cut all-American youngsters just how the toy works. But according to Paul Kurnit, a New York-based advertising executive who has helped promote toys like GI Joe, My Little Pony and Mr Potato Head, the campaign was wildly radical for its time. Image caption Many parents worry about "pester power"
The very concept of promoting brands in 30-second slots was still a new technique, he says. And previously, toy adverts in newspapers and magazines had generally been pitched at those paying for them - parents - rather than the children themselves. "The idea of putting adverts to children on television was a brand new concept," Kurnit says. "It was revolutionary because it hadn't been done before. It was a dramatically new idea to pitch to children." Certainly, its influence was felt in successive generations as the advertising industry searched for new ways to sell youngsters their wares. Nostalgic adults may look back fondly on jingles from their youth which implored them to buy a Slinky, a Barbie or an Action Man. But successive studies have shown that the commercialisation of childhood - not to mention the ever-present fear of pester power - are serious concerns for parents. A 2010 report by the Mothers' Union - an international Christian charity - found three-fifths of parents believed advertising seen by children was harmful to them. "Childhood is now another marketing opportunity. It's another niche market," says Rachel Aston, co-author of the report. "But our main concern is the impact it has on the relationship between parent and child when parents are consistently having to refuse requests to buy things." As a result, most Western countries have voluntary or statutory regulation intended to address such anxieties. In the UK, the Advertising Standards Authority, an independent body which oversees the industry, has strict rules on what can be shown in commercials. Under the Committee of Advertising Practice code, adverts must not "encourage [children] to ask their parents, guardians or other persons to buy or enquire about a product or service for them". Yet fears persist, leading Prime Minister David Cameron to propose an education programme to promote awareness of advertising techniques as well as banning the use of under-16s as "brand ambassadors" in peer-to-peer marketing campaigns. For their part, the advertising and toy industries alike insist they behave responsibly. Indeed, Kurnit argues that both have thrived most when their commercials have promoted imaginative play rather than children as passive consumers. A Marmite advert in 2005 showing a woman screaming in horror at a moving brown mass prompted complaints from the public for terrifying children. The ASA received a number of complaints in 2010 about an Irn-Bru advert in which cartoon animals were led to a butcher's shop. Much of the ASA's complaints procedure involves dealing with concerns about the scheduling of an advert and its visibility to children. Inappropriateness for children is the most common reason for complaints to the ASA over the past six years. What makes an advert controversial? He recognises that pester power exists, but insists that the changing status of children within the family in developed nations has had a far greater impact than any commercial campaign. The answer, he argues, is not further restrictions on the industry but greater parental responsibility. "Unfortunately I think the phenomenon is real but it's much bigger than the advertising business," he says. "The rise of the child has come alongside a rise in the permissiveness of parents. You can't exonerate adverts but they haven't been the primary factor. "More and more parents are dedicated to being their children's friends rather than their children's parents. They can't say no. I think we have a parenting crisis." Certainly, few would dispute that the ultimate off switch resides in the home. While the Mothers' Union study found 75% of parents agreed that regulators were answerable for the content of media and advertising seen by their children, some 61% agreed that duty lay with mothers and fathers themselves. However, even the most conscientious might find it difficult to monitor every nuance of their offspring's media diet. Brian Young, an expert in the psychology of advertising at the University of Exeter, has conducted extensive research into children's understanding of media and marketing. He draws a distinction between the abilities of younger and older children to grasp when someone is trying to sell them something. "We are all susceptible to advertising to some extent," he says. "But children don't really think that advertising is anything but entertainment until they are about six or seven years of age. "The industry is much more aware these days that talking about the child market is not good PR. But they'll play up to the wire when it comes to regulation." Whether the answer lies in further regulation or in households limiting access to the remote control is a question that will rumble on. Parents attempting to exercise control over their children's commercial influences have a rapidly changing landscape to confront, with social media and in-game advertising - that is, advertising in video and computer games - the latest tools to sell wares to the young. For Mr Potato Head, it must feel like 1952 all over again.